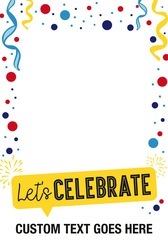 Order a customized Social Media Frame for your next big celebration! Printed on Bubble-X™, this new-and-improved material is much more rigid compared to traditional corrugated plastic. It's non-toxic, eco-friendly, and 100% recyclable. From engagements to weddings, these frames are the perfect way to support friends and family during life’s most joyous occasions.